New Way of Buying Dodge Dart - Drive Dodge - Drive Sport! Chrysler Company offered Internet users a new way of buying its cars. On a special website dodgedartregistry.com anyone can get help “sponsors” – friends, acquaintances or relatives who could pay for part of the purchase of the desired vehicle. At the moment, the object of the unusual action is the new model of the Dodge Dart. Its average price is about 16 thousand dollars. The proposed method of sponsoring is also quite different from the standard fundraising scheme. 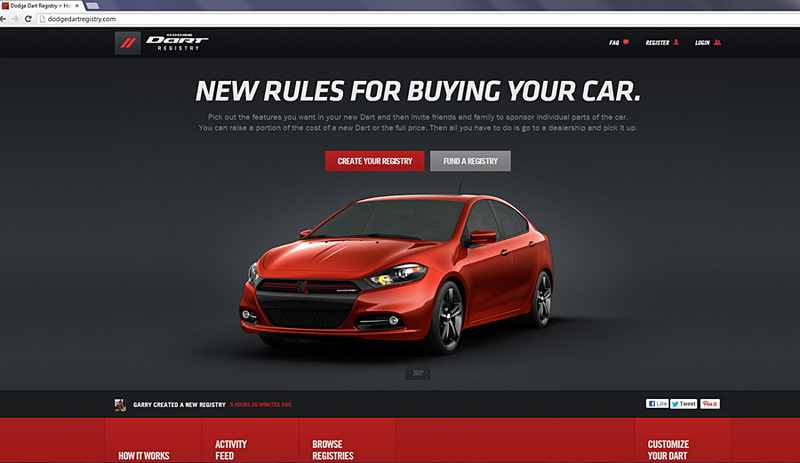 A user who wants to buy a new car, registers on the site and then uses the visual model of the Dodge Dart and selects specific parts, each of which a sponsor can assign a price. In the list of “sponsored parts” can get, such spare parts as headlights, brake pads, bumper and wheels. Number of parts, each of the participants chooses, depending on how much he wants to get from sponsors. The Commission is 9% of the collected amount. It is worth noting that the site is directed towards mostly young people who need help in the acquisition of the first car. This offer is available only to citizens of the United States.